Good morning! 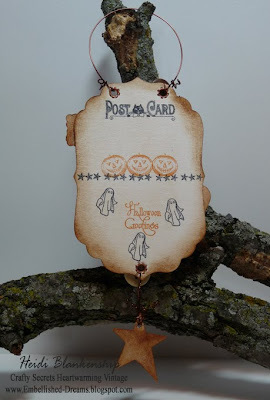 Today is the Crafty Secrets Postcard Challenge Day and Vicki Chrisman our wonderful Design Team leader came up with a Fantastic challenge for us this month! Each DT Member has created a project to share using the NEW Vintage Postcard Kits. We could have any theme and use any NEW Vintage Postcard Kit we would like for the challenge. I love these New Vintage Postcard Kits!! Each kit includes a custom Clear Art Stamp Set, 6 large postcard sized images, 12 smaller images to use for embellishments and 18 ivory chipboard pieces. 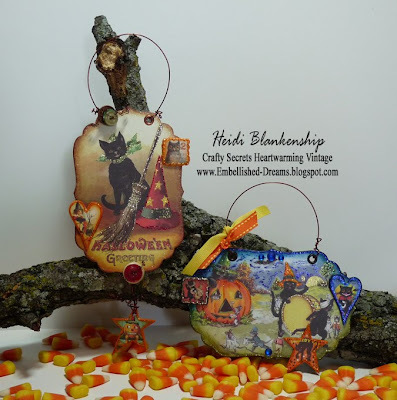 I made three projects to share with you today and I used the NEW Halloween Vintage Postcard Kits. 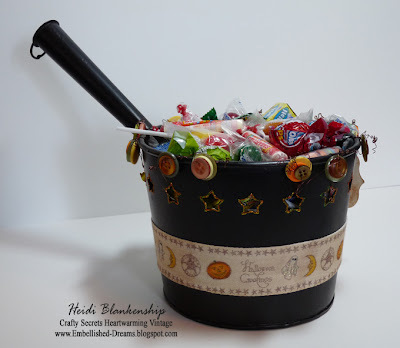 For my first project I designed a Halloween candy bucket. The little pan/bucket was a great find at a garage sale and I knew exactly what I wanted to do with it. Before I started working on the bucket I wanted to create a custom ribbon to tie around it. I started looking through my stash of ribbons and I found some twill ribbon that would be prefect. 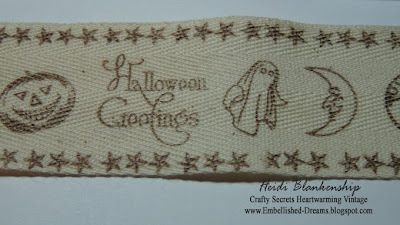 The twill ribbon is 1-1/2 '' wide and I stamped several of the images from the custom Clear Art stamp set that is included in the Halloween Postcard Kit onto the ribbon using Tsukineko Memento Rich Cocoa Ink and set it aside to dry. Here is a close up of the ribbon. 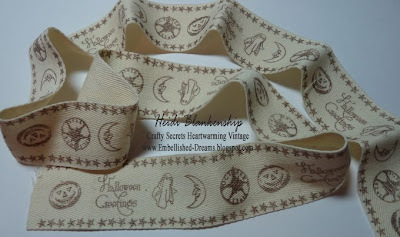 The images stamp so clear and wonderfully onto the twill ribbon! 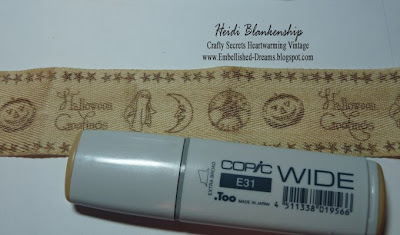 Here is a picture of the ribbon after the entire piece was stamped. I know some of you might be thinking, oh my gosh how long did it take to do that? Honestly it was less then ten minutes to do the stamping. The ribbon looks fantastic just the way it is so if you wanted to stop at this step you could or if you wanted to add a little color and more detail you can keep adding to it and that is what I did. I took a wide Copic marker (E31) and I went over the whole ribbon to give it more of a vintage look and then I colored some of the images in using Copic markers. Here is a picture of the backside of the bucket and you can see the finished piece of twill ribbon. I colored the pumpkins, moons and added black eyes and diamond stickles to the ghosts. The bucket was already painted a dark brown and I used a sanding block to give it a more worn look. It also had little stars cut out going around the rim and I added some Orange Peel Stickles from Ranger to the stars. 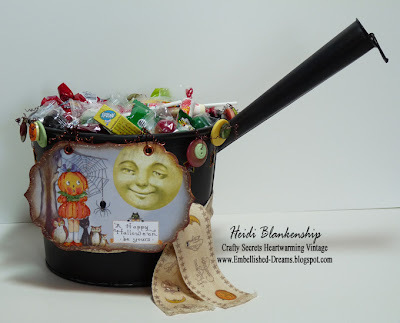 For the front of the candy bucket I added one of the vintage Halloween images from the Halloween Vintage Postcard Kits. To glue the image onto the chipboard I used 3 in 1 Advanced Craft Glue from Beacon. Once the glue was dry I used finishing files from CTMH to get the edges all nice and smooth. Then I inked the edges with Vintage Photo Distress Ink from Ranger. 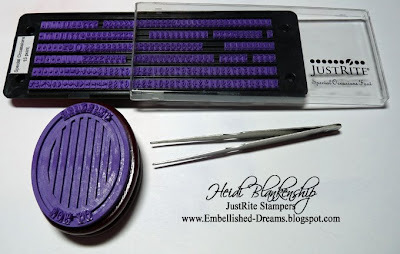 I also added several colors of Stickles to the image and finished it off by adding Rock Candy Distress Stickles to the edge and copper eyelets. 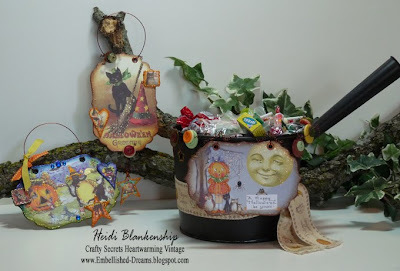 I also added vintage buttons with copper wire going around the edge of the bucket and then filled it up with goodies for Halloween. For my second and third projects I made two hanging postcards. 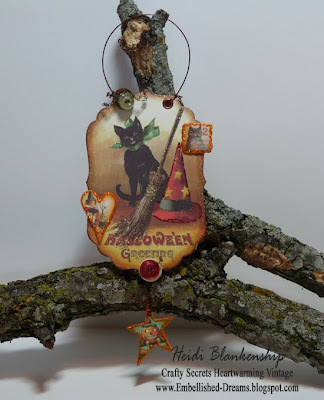 I would love to make up several of these to hang all over the house for Halloween! You can use them together or alone and they would also look great on the front of a gift bag or package for someone. 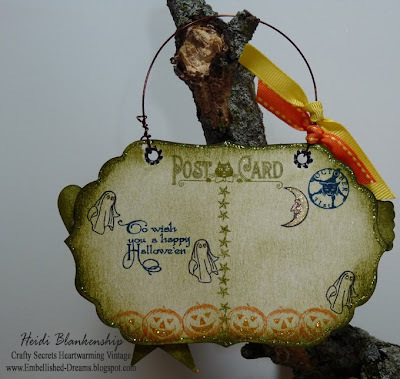 The postcards are quick, easy and fun to make and it's up to you as to how you embellish them. I use 3 in 1 Advanced Craft Glue from Beacon to adhere all the pieces. I inked the edges on both postcards and added stickles from Ranger to the images. I also stamped images on the back of the postcards, added eyelets, buttons, bling and copper wire. Other~Beacon-3 in 1 Advanced Craft Glue, Ranger-Stickles Diamond, Orange Peel, Lime Green, Gold, Dark Blue, CTMH- Finishing Files, Crop-a-Dile, Black Eyelets, Copper Wire, Creative Impressions-Bits of Bling Bright Smooth Circle Bling, Yellow and Orange Ribbon Please be sure to hop on over to all of the other Crafty Secrets DT Members Blogs and see what they have created to share with you!! I can't wait to see what they have designed!! 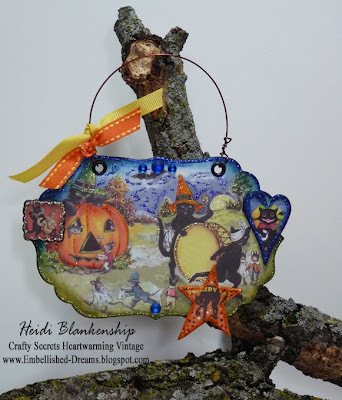 Also don't forget to check out the Crafty Secrets Heartwarming Vintage Blog, Sandy will be announcing the winner of the Halloween Blog Candy!! On a more personal note I just wanted to say to my blog readers I am sorry I haven't been able to post very much this past month! We have been having some problems with our newer computer and it is still in the shop. I do have an older computer but it is so much slower and doesn't have the same programs I am used to using so trying to do a blog post takes forever! :( But hopefully we will have the newer computer back very soon!! Thanks for understanding!!! Hello and Welcome to the JustRite Christmas Blog Hop! 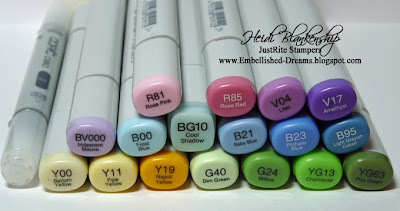 I am very excited about today's Blog Hop, it's going to be soooo Huge! The JustRite Chritmas Blog Hop was open to several Guest Designers who were welcome to join in the fun, we have 33 Designers in all!!! That is Fantastic and I can't wait to see what all of these talented ladies have created!! Here is a list with links to the JustRite Blog and also to all of the Designers participating in the Christmas Blog Hop. For my project today I created a Snowman Ensemble which includes a candy jar, Christmas ornament and a Christmas card. The holidays will be here before we know it and then we will all be needing little gifts for teachers, co-workers and friends and this snowman gift set would be perfect! For all three projects I used the same papers and inks. 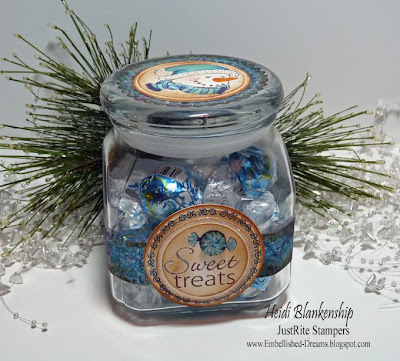 For the candy jar I used a sentiment and image from two of the NEW JustRite Christmas stamp sets, Old Fashion Christmas Set and Something Sweet Set. 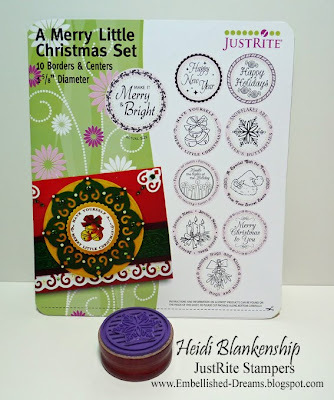 The Old Fashion Christmas Set has four borders and centers and works with the 3-1/4 '' Wood Stamper. 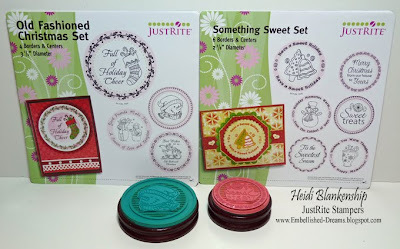 The Something Sweet Set comes with 6 borders and centers and works with the 2-3/8 '' Wood Stamper. 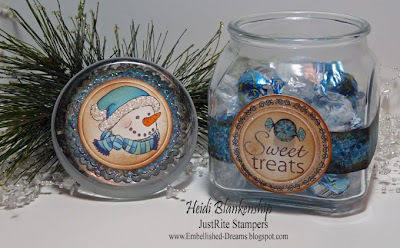 To create the candy jar I started by making a belly band with the designer paper to go around the jar and I inked the edges. Then I stamped the sentiment Sweet Treats from the Something Sweet Set with brown ink and on the candy piece I did paper piecing. 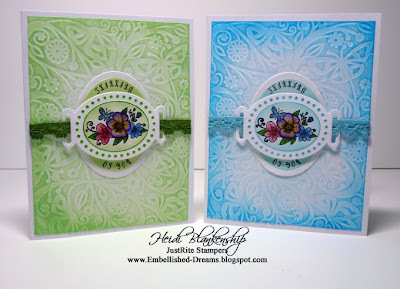 The border was stamped with blue ink and then I inked the edges on both of the circle diecuts. To create the circle diecuts I used the Wizard, Classic Circles Lg. S4-114, Classic Circles Sm. 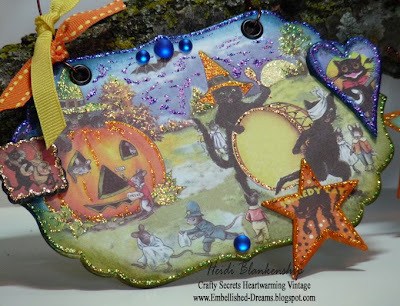 S4-116 from Spellbinders. For the lid of I stamped a snowman image from the Old Fashion Christmas Set with brown ink and colored with Copic markers. Then I added a scalloped circle with designer paper from the mat. The diecuts were made using the Wizard, Classic Circles Lg. S4-114, Petite Scalloped Circles Lg. 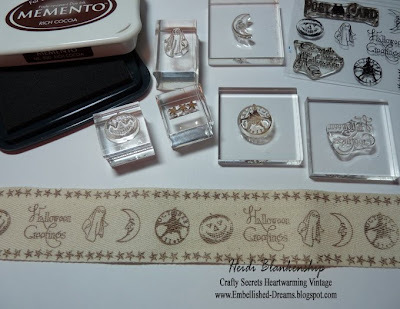 S4-115 from Spellbinders. I also added some liquid applique' and glitter. For the snowflake center I used a snowflake image from the NEW A Merry Little Christmas Set. 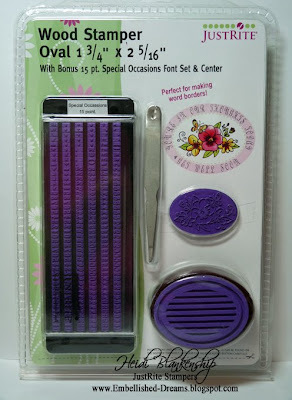 This set contains 10 borders and centers and works with the 1-5/8 '' Wood Stamper. To create the Christmas ornament I cut out two pieces of light weight chipboard and two pieces of designer paper using the Wizard and Labels Five S4-229 and sandwiched then all together to make the base for the ornament. 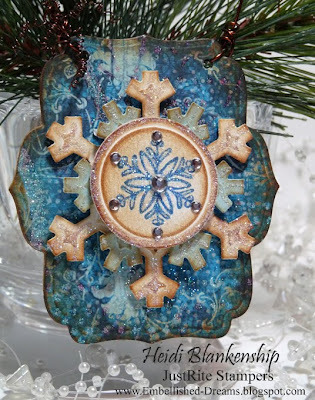 Then I made the snowflake diecuts using Create A Flake 2 S4-223. For the center of the snowflake I used the snowflake image from the center of A Merry Little Christmas set with blue ink. All of the edges were inked and I copper wire to create the hanger and added some rhinestones and glitter. Both the image and the sentiment are from the NEW Old Fashion Christmas Set. As mentioned above the Old Fashion Christmas Set comes with four centers & borders and works with the 3-1/4 '' Wood Stamper. To create the Christmas card I stamped the snowman image with brown ink and colored with Copic markers. For the sentiment I used blue ink and then I inked the edges of both the circle diecuts. 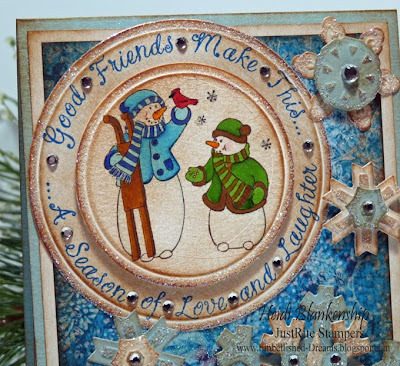 I added several snowflakes to the card using the Create A Flake 2 S4-223 from Spellbinders. To add some dimension to the card I used several popdots and I also added some glitter and rhinestones. Thank You so much for stopping by today!! 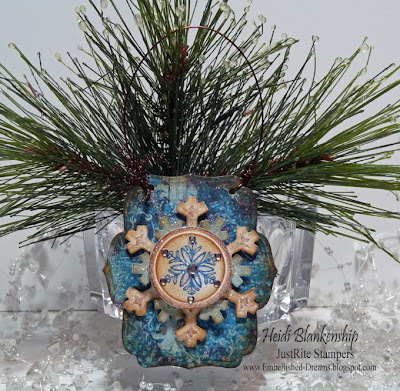 I hope you enjoy and the creative designs in the JustRite Christmas Blog Hop!! I am off to see what all of the ladies have created! Hello!!! OMGosh I can't even begin to tell you how excited I am to be doing a blog post!!!!! I am sorry for my absence but after I came home from CHA we went on a family vacation (had a Wonderful Time!!) and came home to a blue screen on the computer!! We are still having some issues with the computer but at the moment it is up and going and I am keeping my fingers crossed!! Technology is wonderful when it works but what a bummer when it doesn't! I have missed you all so much!! I have some exciting news that I am just dying to share with all of you BUT because of the computer issues I am running a little behind on a few things so you are all going to have to wait just a little longer for the news! *wink* I also wanted to mention that I had talked to several people at CHA about doing a step-by-step tutorial on how to make the candles pictured (click--->) HERE (and scroll to the bottom of the post) and I am still going to be doing that but again because of computer issues and a few other posts that need to be made the tutorial will be coming in the next week, so keep an eye out for it! Now would you like to see some new art? ;) The project I have to share with you today is a set of note cards that I made right before I left for CHA. 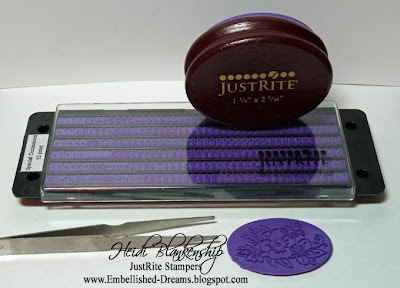 The stamped image and sentiment is from JustRite Stampers, using the Wood Stamper Oval 1-3/4'' x 2-5/16'' with Bonus 15 pt.Special Occasions Font Set & Center. I love the center image that comes as a bonus with this set! Pansies are one of my favorite flowers and I love the little butterfly in the image too. 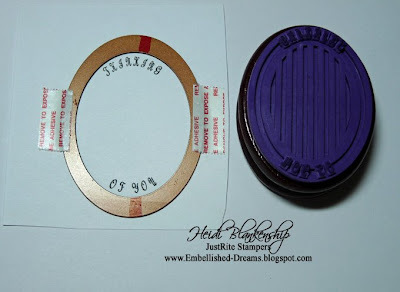 I was also very excited when I realized that the centers for the 1-3/4'' x 2-5/16'' Oval from JustRite Stampers fit into one of the new Ribbon Tag Trio 2 S4-234 die templates from Spellbinders! The centers fit perfectly into the oval shaped tag in the set. I stamped the image four times onto white cardstock and then taped the oval tag for a perfect placement. After I made all of the diecut tags then I colored the images in using my Copic markers. After all the coloring was done then I went over the images using my Spica Glitter Pens from Copic. After I colored the images then I popped the diecut back into the die template and airbrushed the centers and the dots on the outer edge. Here is a picture of all the tags when they were finished. I also wanted to add a sentiment to the cards so I used the Bonus 15 pt. 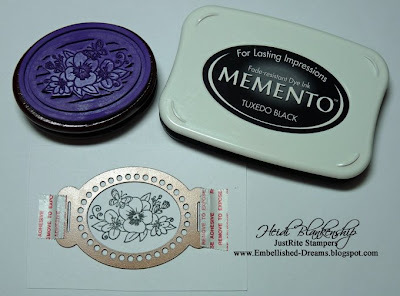 Font Special Occasions along with the Wood Stampers Oval 1-3/4'' x 2-5/16''. 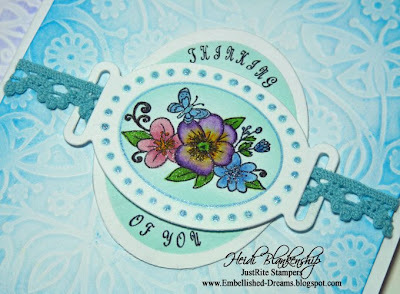 I stamped the Thinking of You sentiment and made four oval diecutes using the Classic Oval Small S4-112 die template from Spellbinders. Then I airbrushed the centers to match the tags using Copic markers. 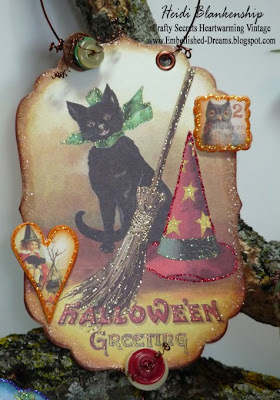 For the background I used a piece of white cardstock and the Butterfly Impressabilites I2-1002 from Spellbinders and ran it through the Wizard. Then I removed the Impressability and inked each piece of cardstock to match the tags. To do the inking I used a cotton ball, start on the outer edges and in a circular motion working into the center getting a lighter color as I go. I only used white cardstock to create these card and used my inks and Copic markers to add the color. To assemble the cards I started with a white base, add the inked Impressability cardstock as a mat, then the oval with the sentiment and lastly the tag diecut with the floral image along with some ribbon and pop dots. 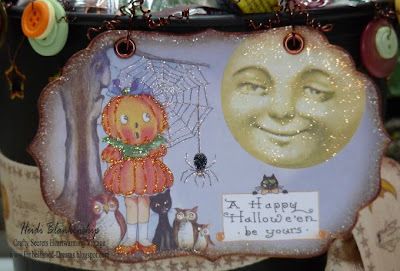 Other~Spellbinders-Wizard, Classic Ovals Small S4-112, Ribbon Tag Trio 2 S4-234, Butterfly Impressabilities I2-1002, Copic-Sketch Markers & Spica Glitter Pens (as shown above) Ribbon, Pop Dots, Cotton Balls. Thank you!! Thank You!! THANK YOU so much for stopping by today!!! I really appreciate it and I always Love reading your comments!! Keep your fingers crossed for me that the computer keeps working!! I have several things to post and share with all of you so if by chance you don't see me again for a few days you will know I am having issues with the computer--but let's hope not! *wink* I hope you all have a wonderful day and thanks again for stopping by! 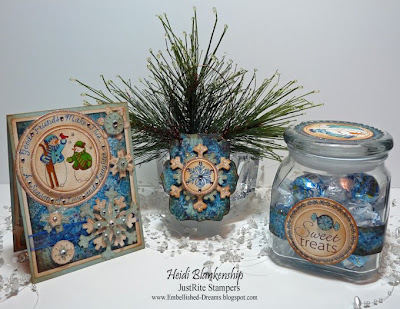 I also wanted to let you know that next Monday, August 17th JustRite Stampers will be having the Christmas Blog Hop and believe me you won't want to miss this!!! 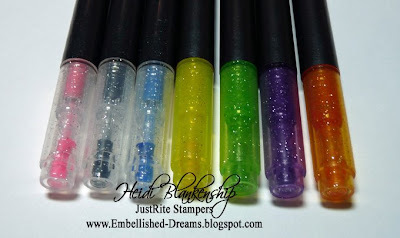 Check out the JustRite Blog all this week to see Sneak Peeks and have a chance to win some Fantastic Blog Candy! !